Arrive in Venice, where we will either pick you up at the airport or meet you at a pre-arranged spot for transfer to Slovenia. Soon after crossing the border we’ll stop to explore the Škocjan Caves, a UNESCO World Heritage site that is also one of the largest undergound canyons in the world. Afterward, enjoy your first taste of homestyle Slovenian cuisinebefore heading to wine country and a beautifully restored300 year old farmhouse that we will call home for the night. Wake up to a healthy, farm-fresh breakfast (really – go check out the garden!) and views of surrounding vineyards in the morning light. We’ll head out for our first run, taking in the idyllic farmland, thick forests, rolling hills and postcard-perfect villages of the area. Finish at a local family-owned wine cellar where you’ll be treated to lunch and plenty of tastings, then take the afternoon to relax and indulge in the peaceful surroundings. That evening we’ll enjoy one of the best dining experiences in the country – right at our farmhouse! After a fresh farm breakfast it'll be time to say goodbye to Slovenia and hello to Croatia! 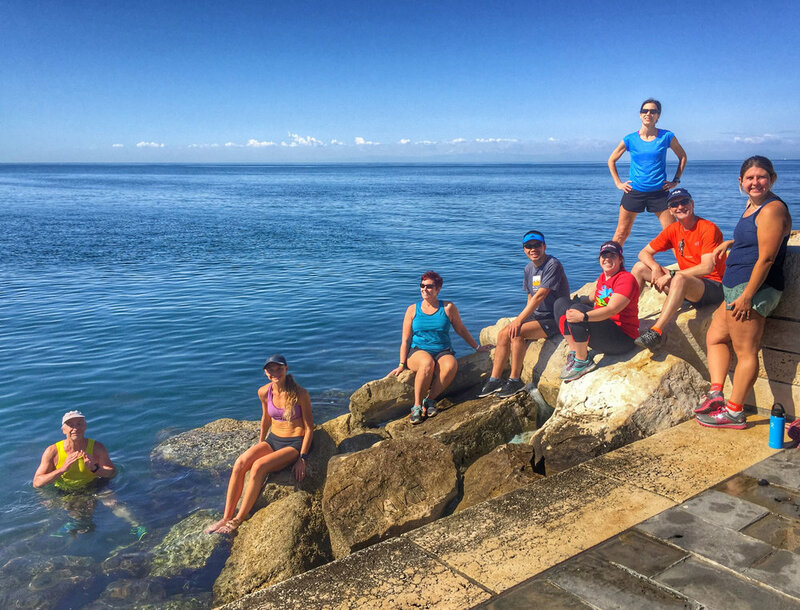 The mid-morning run begins in Slovenia and ends in Croatia (yes, you'll need to carry your passport!) with glittering views of the Adriatic Sea along the way. Afterward we'll enjoy a long, indulgent lunch full of a prized regional specialty - truffles! Finally, we head further down the Istrian peninsula to a historic and romantic seaside town where you'll be free to wander and soak in the sunset with a glass of wine at the waterfront. *This particular lunch is quite long, and typically leaves everyone full for the remainder of the day. Wake up and explore the historic city center, or sleep in if you’d like! We’ll go for a relaxed run en route to the ferry terminal, where we’ll catch a ride over to Island Cres, our home for the next two nights. You’ll be welcomed to a picture-perfect farmhouse set among lavender fields and lemon orchards by our hostess, who also happens to be a professionally-trained chef. Get settled in, then fuel up with a home-cooked feast out on the patio – tomorrow is the long run! Get ready – today is the big run! 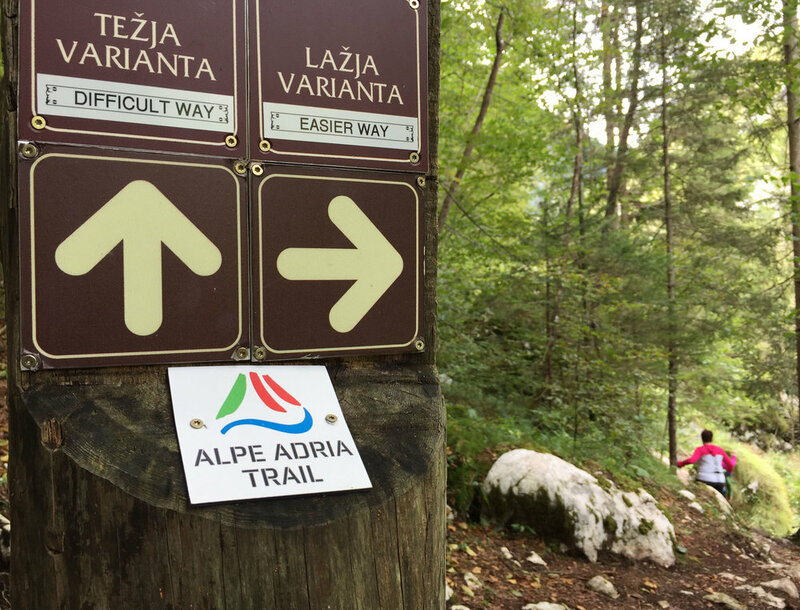 Those who run the full route will cover nearly the full length of the island via both trail and road, featuring sweeping views of the crystal clear Adriatic Sea and picture-perfect ancient villages, and those who choose a shorter distance will also hit the highlights. Finish at our house with a locally-sourced gourmet lunch before spending the evening recovering in the best way possible - a chartered sunset cruise on the Adriatic! After an optional morning recovery run on the island, we'll head to Ljubljana, the charming capital of Slovenia (also now the "Green Capital" of Europe), where you’ll have the remainder of the day to explore on your own: sample gelato, sit at a riverside cafe, visit museums, or simple wander around - the city center is car-free! - and soak it all in. After breakfast we’ll pack up and head to Lake Bohinj for a mid-morning run. The route is part trail along a dramatic river gorge and part cruise around this pristine alpine lake, finishing with time to swim and relax at a small beach. Afterward we’ll continue our journey with a stunning drive through the Julian Alps, stopping at Slovenia’s most-photographed spot and for a delicious meal in Italy (it’s right there!) along the way. Our final destination is an alpine homestead nestled in the Soca River valley, surrounded by the towering mountain peaks of Triglav National Park. Wake up at the foot of the Julian Alps for coffee with a view... then lace up your shoes! 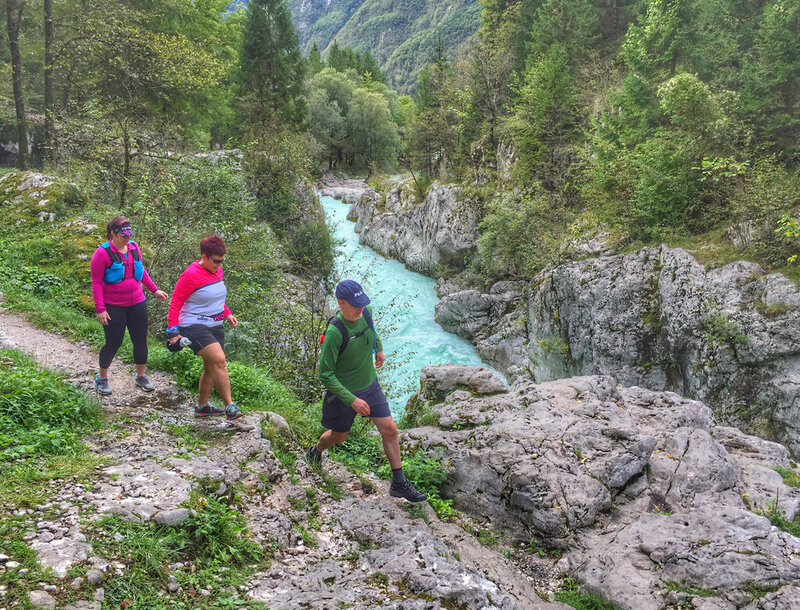 Today's run begins at the source of the Soca River and follows this incomprehensibly blue river by way of historical footpaths and magical forest trails. This run is quite technical, but the views make it all worth it - take your time, and bring a camera! After a picnic lunch and a dip – err, icebath – in the river, there will be time to explore the area further: raft the Soca, learn about the major role that this area played in WW1. Later, enjoy spectacular views and a very special final dinner prepared by our hosts. Time to say goodbye! Enjoy a final big breakfast before heading to the airport in Venice or connecting to additional travel. This trip will begin in Venice, Italy with an immediate transfer to Slovenia. We recommend arriving a day or two early to explore Venice on your own. Those who fly in on May 11 should arrive no later than 12 noon. Departures are also from Venice; please book flights that depart no earlier than 12 noon on May 19. All levels welcome! Daily run maximums are listed on the itinerary and there are no minimums nor time restrictions. A $600 deposit secures your spot. Registrations after February 11 will be due in full. Balances due by February 11, 2019. Please refer to the FAQs on our website for our cancellation & refund policy. There will be a minimum of 6 and a maximum of 10 runners. Though we don't anticipate any problems hitting the minimum, please do not book flights until we confirm that it has been met. Participants will need a passport with at least 6 months of validity left. No visas or vaccinations are required for US citizens in Europe, though you may want to consider some standard vaccinations if you are a first-time traveler. Participants from other countries should check with their consulate for entry requirements. Please ensure that you arrive in Venice no later than 12 noon on May 11 and depart Venice no earlier than 12 noon on May 19. If you arrive early (recommended!) then we will pick you up at a pre-arranged time/place on May 11. If you extend your stay in Venice then we'll be happy to take you to your hotel on May 19. If you arrive/depart outside of these parameters then you will be responsible for your own airport transfers. Please note that travel insurance is strongly recommended. Although we hope you never need it, we've seen enough to know that it can be a lifesaver in the event of a medical emergency, flight delays, lost baggage or cancellation on your part (Break your leg two weeks before departure? Insurance can cover the entire cost of your entire trip! Flight delays cause you to miss the first day? Insurance can cover the cost of transport to meet up with us! ).